Shea Butter: Shea Butter is well known for it’s moisturizing properties, which helps to repair and nourish the skin. There is recent evidence implying that Shea Butter may also help the skin to produce more collagen. Hyaluronic Acid: This chemical compound can be found naturally in the skin, and is frequently used as a safer and natural treatment in place of Botox. Hyaluronic Acid is both a moisturizer and helps to increase collagen production. Vitamin C: A powerful anti-oxidant that is included in many skin creams, vitamin C is useful at reducing stress of the skin by ensuring that skin cells have an adequate amount of oxygen and helping the skin to appear brighter and younger. Retinol: This form of vitamin A helps to reduce the damage that is caused by stress and external damage (such as skin damage due to smoking or the sun). Retinol also helps to increase collagen production. Green Tea and Cucumber Extracts: Green tea and cucumber extracts both contain exceptional moisturizing and anti-oxidant properties. 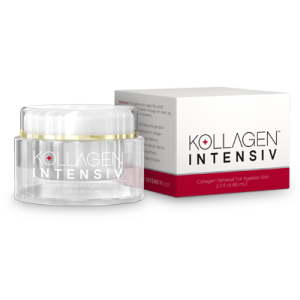 The complete list of ingredients of Kollagen Intensiv are: Glycerin, Tocopherol, Palmitoyl Tetrapeptide-3, Ascorbyl Palmitate, Retinyl Palmitate, Magnesium Ascorbyl Phosphate, Hydrolyzed Hibiscus Esculentus Extract, Acetyl Hexapeptide-3 & Palmitoyl Oligopeptide, Hesperidin Methyl halcone, Glycine Sojo Oil, Gluconolactone, Dipeptide-2 & Dipalmitoyl Hydroxyproline, Cucumis sativus Fruit Extract , Camellia Sinensis Leaf Extract, Avena Sativa,Kernel Extract & Retinol. 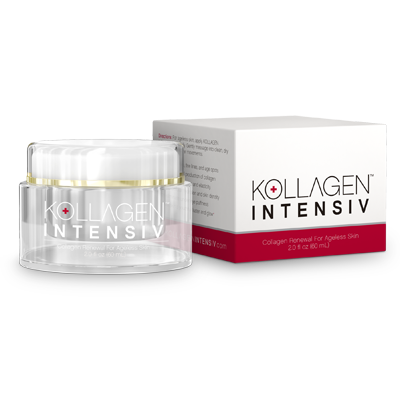 Kollagen Intensiv is definitely impressive at a first glance, but sometime that isn’t enough. We want to know if this cream can really work to address all of the benefits that it claims. As usual, we took a look at the ingredient list first. The active ingredients are all both excellent for the skin, and studies (that were not conducted by the company) have proven that these ingredients are able to assist in an increased amount of collagen production. The only thing that raised concern on the ingredient list was the low concentration of Retinol. This one key ingredient has been used for years due to it’s anti-aging properties. The higher amount of retinol that is included in the cream, the more effective the cream will be, and the quicker the consumer will see results. This doesn’t mean that it will not be effective, but this may be the reason that it takes approximately 80 days to see those dramatic results. We also double checked to see how many reports there were from customers not getting their money back, and it looked great! Given the ingredients and ninety day money back guarantee, this product is more than worth the money, works great on fighting the signs of anti-aging, and you really have nothing to lose!